SRINAGAR: A 32-hour gunbattle between forces and two LeT militants, who took cover in a building in Karan Nagar in Srinagar, ended today with the death of both of them, police said. An official said two bodies – along with weapons – have been recovered from the site of the gunfight. Ravideep Sahi, IG-CRPF, Srinagar, said the forces recovered two AK-47 assault rifles and eight magazines from the site. The gunbattle, which began yesterday morning, came two days after militants attacked an Army camp in Jammu’s Sunjuwan area, killing seven people, including six Army soldiers. Three attackers were also killed in retaliation by the Army. Inspector General of Police (IGP), Kashmir, S P Pani said the militants who tried to attack the CRPF camp in Karan Nagar area early yesterday morning belonged to the Lashkar-e- Taiba (LeT) group. “The materials we recovered from the site of the gunfight suggest that the militants belonged to LeT. But the militants have not been identified yet and we are trying to ascertain their identity,” he told reporters at a joint press conference with CRPF officials. 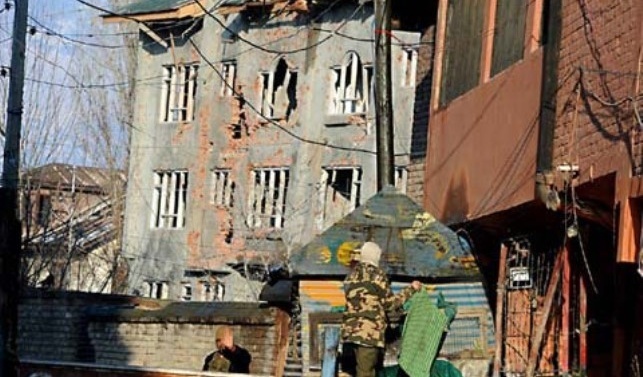 Pani said it was a clean operation without collateral damage, adding that it continued for so long as the building where the militants were hiding was a five-storey structure. An alert sentry had foiled their attempt to attack the CRPF camp by opening fire on them, after which they took shelter in the under-construction structure in Karan Nagar locality that has both commercial and residential buildings. A CRPF trooper was killed and a policeman injured in the initial exchange of fire with the militants yesterday. After an overnight lull, the operation resumed today morning. According to the IG-CRPF, forces conducted a comprehensive recce of the area and devised a strategy before launching the operation. “We rescued five families of CRPF personnel as well as a few civilians and once the sanitisation (process) of the area was done, the operation was launched,” he said. The paramilitary force, he added, could have suffered huge losses had it not been for the alert sentry who thwarted the fidayeen attack. “In this operation, I think the credit goes to our sentry, a constable who first stopped this fidayeen attack to enter the battalion headquarters. Had they entered, there would have been a lot of losses,” he said. Asked if there were reports of more militants in the city or inputs of more attacks, the CRPF officer said the forces were on the alert. “The conditions and the environment in which we are working, I can only say this, that our men on ground are very alert to the security challenges which we face. Our men and officers are sensitive and whatever challenges are there, we will face them,” he said. « Previous Article Israel "to stay Jewish even at price of human rights"